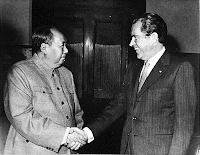 There is an old Vulcan proverb saying that only Nixon could go to China. Only a man who used to work for Joseph McCarthy could set America on a path to better relations with a virulently Communist country. A few years after Nixon went to China, Menachem Begin, the Israeli Prime Minister who represented people believing that the state of Israel should stretch from the Nile to the Euphrates, gave Egypt back all the lands conquered in a recent war and made a lasting peace with Israel’s largest enemy. They said back then that only Begin could make peace with the Arabs. Today, I want to submit to you that only Trump can make single-payer health care happen in this country. Only a billionaire, surrounded by a cabinet of billionaires, representing a party partial to billionaires, can make that hazardous 180 degrees political turn and better the lives of the American people, and perhaps the entire world as a result. Oh, I know it’s too soon to make this observation, but note that both Mr. Nixon and Mr. Begin were deeply resented (to put it mildly) in their times, by the same type of people who find Mr. Trump distasteful today. The liberal intelligentsia back then did not have the bona fides required to cross the political chasm between one nation and its ideological enemies, or as real as death immediate foes. The liberal intelligentsia today lost all credibility in this country when it comes to providing a universal solution to our health care woes. Free health care (and free college) are not solutions. These are rabble rousing slogans to gin up the vote, slogans that end up in overflowing trashcans left in ballrooms littered with red white and blue balloons after everybody goes home to get some sleep before the next round of calls to solicit funds from wealthy donors for the next campaign. Providing proper medical care to the American people is a monumental enterprise that engages tens of millions of workers from all walks of life, every second of every day, in every square mile of habitable land, littered with the hopes and fears of hundreds of millions of invisible men, women and children who call this great country their home. This is not something that can be made free. Nothing is free in our times, not even sunshine and fresh air. For the jaded, the cynically inclined, and those who are simply too afraid to jump off this cliff, and therefore argue that single-payer is not politically feasible, I have a simple question. Did you all think a couple of years ago, that a President Trump is politically feasible? Okay then. Here is what I believe could be a relatively plausible scenario enabling this one-of-a-kind administration to use its unconventional political capital (if you can even call it that) to get us on the road to making health care great again, greater than ever before. The current system, held together with string and duct tape must undergo a seismic shock, preferably a moderate shock and one that does not involve war and famine. The way things look now, the most likely implosion will be the Obamacare individual market. If the Trump administration holds back ransom money from insurance companies (a.k.a. CSRs), or engages in other mischievous behavior, and the individual mandate is not enforced, we may very well have a minor disaster on our hands. In addition, the President's Commission on Combating Drug Addiction and the Opioid Crisis is requesting that the President declare the opioid epidemic a national public health emergency. Put these two together and you see how lots of people are, or will shortly be, in dire need of medical services not currently available to them via existing “insurance” channels. The opioid crisis will need much more than providing care for its current victims, but we will need a coordinated effort to provide all necessary medical services to people addicted to opioids who are uninsured, or whose insurer is refusing to pay for the extensive programs needed for recovery. People who were able to afford insurance under Obamacare without, or with minimal, subsidies and are now left hanging to dry will also need a solution, and if they are sick, they will need immediate relief. This would be the perfect time to cut through the red tape and institute the Disaster Relief and Emergency Access to Medicare (DREAM) program. The DREAM will open Medicare to the victims of Obamacare and the victims of the opioid epidemic. This will be put in place as a temporary disaster response program, subject to extension of course, until a more permanent solution can be found. I doubt too many people in Congress could vote against such measure. No matter how short lived, all government programs including temporary ones need rules and regulations to execute now, and to be replicated in future emergencies as needed. Besides, any respectable bill needs more than just a title. How do we define opioid addiction? How do we define Obamacare victim? How do they sign up? What do they get? How much will it cost? Congress will appropriate $45 billion for this program for a period of five years to cover administrative costs, medical costs and program analysis costs. Emergency funding will be provided to Federally Qualified Community Centers (FQHCs) to set up a process for opioid addiction screening. FQHCs are non-profit clinics, funded by the Federal government to serve low income populations regardless of ability to pay. All physicians and staff are salaried. The funding will be administered by the Health Resources and Services Administration (HRSA) and defined by the Secretary of Health and Human Services (HHS). Any American citizen or lawful permanent resident will be eligible to access any FQHC and undergo opioid screening as specified by the Secretary at no cost. Individuals eligible for relief, based solely on clinical criteria, will need to provide information about their insurance status. Upon receipt of consent from the individual or legal guardian if the screened individual is a minor, eligibility results and insurance information will be sent from the FQHC to CMS for enrollment in the DREAM program. If the eligible person (EP) is currently covered by commercial insurance, CMS will contact the EP’s insurance plan and require that the plan contacts the EP or legal guardian and obtains proper consent to transfer the EP’s coverage to the DREAM program. Following EP consent, Medicare will become the primary payer for the EP. Medicare at its sole discretion may discontinue eligibility for the EP and the commercial plan must reinstate coverage for the EP at that time. All subsidies paid by the Federal government to the insurance plan, if any, will be paid into the Medicare trust fund for the duration of DREAM participation. The EP will pay to Medicare premiums equal to the last monthly amount the EP paid to the commercial plan. Medicare will cover all opioid related services with zero deductible and zero copay. For other services the EP deductible and copays will be equal to those of traditional Medicare beneficiaries (parts A, B and D). Medicare will end DREAM eligibility for an EP who missed 3 consecutive monthly payments. If the EP is insured, or eligible to be insured, through Medicaid or any other public program, Medicaid or any other public program, will transfer into the Medicare trust fund estimated monthly premiums as calculated by the Secretary for the duration of DREAM participation. Medicaid will become the secondary payer for EPs previously enrolled, or eligible to be enrolled, in Medicaid. If the EP is uninsured and not eligible for public insurance, the EP will be enrolled in Medicare (parts A, B and D), under the same terms as beneficiaries 65 years or older for the duration of DREAM eligibility, except that all opioid related services will be covered with zero deductible and zero copay. Congress will appropriate $45 million for this program for a period of five years to cover program administration, evaluation and analysis. All other program costs, if any, will be absorbed by CMS budgets. Any American citizen or lawful permanent resident who is not offered employer sponsored insurance, and is not eligible for Medicaid or another public insurance plan, and is not eligible for Federal subsidies on the Obamacare exchanges equal to at least 50% of total costs of the current benchmark plan, or resides in a county where no Obamacare plans are available on the exchange on the first day of the open enrollment period, will be eligible to enroll in Medicare parts A, B and D, at an annual rate of average Medicare spending per beneficiary (MSPB), adjusted for EP age. The Secretary shall publish a list of DREAM premiums for three age bands, 0-21, 22-45, 46-64, no later than one month before the first day of open enrollment for the Obamacare exchanges. All DREAM rates will be assessed and billed for each individual EP. No family rates will be available and no Federal subsidies will be given to DREAM enrollees. The EP, or a legal guardian if the EP is a minor, is responsible for premium payments to Medicare. EP deductible and copays will be equal to those of traditional Medicare beneficiaries (parts A, B and D). Medicare will end DREAM eligibility for an EP who missed 3 consecutive monthly payments. For each program year the Secretary shall conduct and publish comparative analyses of Federal spending on Obamacare exchange enrollees and DREAM program enrollees to inform Congress and the public on the merits of each program. See? Wasn’t that bad now, was it? Defining the program is relatively easy and the above is just an abbreviated example. Other details will need to be added, removed or changed, but the main idea here is to open Medicare in the short term to people who are hurting and are underserved by the commercial health insurance markets. There will of course be consequences. First, the Obamacare exchanges will most likely go bust, and we will have to expand the DREAM to allow enrollment of people who will bring their subsidies with them. Second, employers may decide to fund Medicare premiums instead of dealing with health insurance in house. Third, the folks who don’t qualify for the DREAM program may start chomping at the bit, seeing how DREAMers get to choose pretty much everything without breaking the bank. Yes, yes, I know. I’m being too clever by half, but surely someone who professes to be the voice of the forgotten men and women, could see his way clear to make this happen. It will, after all, lead to a complete repeal and replace of Obamacare. And for all timid liberals enamored with the poetry inscribed at the feet of Lady Liberty, let’s help the President erect a statue of liberty at the gates to Medicare. Best knee pain relief cream stands out owing to its cooling properties. The cream contains menthol—a cooling and analgesic ingredient—which has a right away desensitizing result, followed by deeper pain relief when regarding 10 minutes. The cream is non-greasy and straightforward to use. Nice Post! Thanks for sharing such informative healthcare articles for us. Is Single-Payer the Right Payer?